Available for PC, PS4 and Xbox One. There’s quite a bit to say on this game, while there is some of it I don’t want to say here. So, the clever ones among you, will conclude there is quite the story in this game. And you’d be right. But rather then talk it about it here and start listing off spoilers, I’m going to do another story discussion post talking about it as I did with “Seasons After Fall”. So look out for that coming out soon. With that said, on to the review proper. 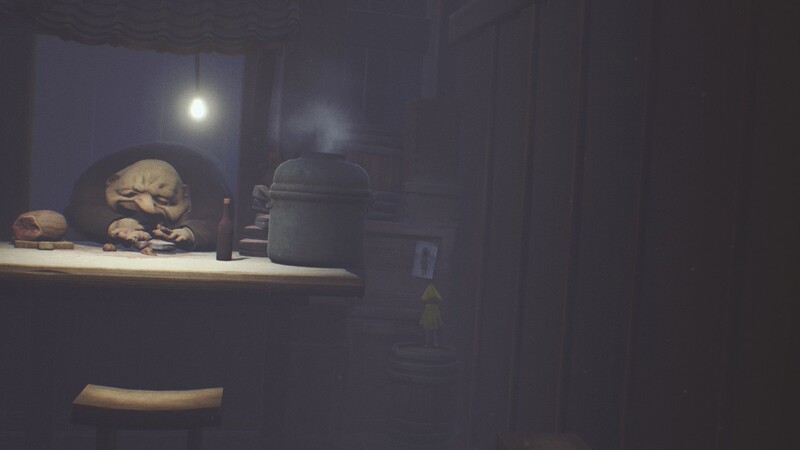 “Little Nightmares” in a clinical sense is a 3D, side-on puzzle platformer. In a stylistic sense, it’s got elements of horror and grotesque in a chiaroscuro style punctuated with vibrant colour. To make that sound less pretentious, it’s like “Limbo”/“Inside” but with depth movement, more Miyazaki-ien elements (the Studio Ghibli anime director of “Spirited Away” if the name passes you by,) in a washed out colour palate rather then just black and white. So think of “Inside” then spear off in an anime direction. The whole game is presented without dialogue. Although, like an anime, the movements, character design and standing positions are exaggerated to convey emotion and thought. Like the core selection of monsters are grotesque giants, hulking around in stomps wrapped in lose sacks of skin that droop like a melted candle. As you play as a small girl, when they all run at you they do so bent over with arms outstretched and fingers pawing. You know not to go anywhere near them just by they way they move. It also acts as binary to the character you play as. You play as Six. They never say her name in-game but a look online says her name is Six. 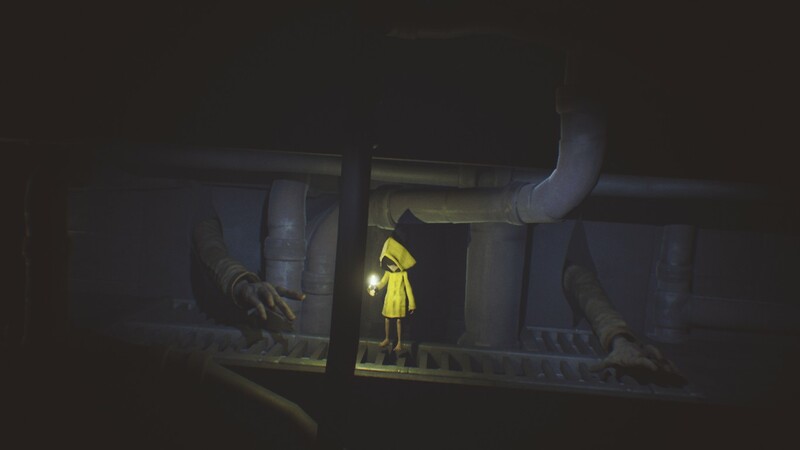 She’s a little girl dressed in a bright yellow raincoat that wakes up on a ship called the Maw (again, not named in the game but the internet says that’s its name). From there, you look for an escape, platforming and puzzling your way through and around the blind, long armed Janitor, the pair of bulbous Cooks, the engorged Guests and the slender and ghostly Lady of the ship. The puzzles themselves are fine. The controls make way for pushing, pulling, climbing and dashing so what can be done is limited but simple to work around so the puzzle logic is easy to understand. What isn’t very good is that at times the game calls for pixel perfect precision platforming. It only came up a few times but when they did, the game basically stopped as attempt after attempt was done. I’ve seen people complain about the checkpointing but it wasn’t that much of a problem. That combined with the four p’s meant that some sections just became tedious as you platformed your way back to the point that required the pixilated precision to proceed. Those sections was where the tone broke with an audible snap but those sections were far enough apart that it had time to build up again before the issue reared it’s head again. So while it caused a break in the action, it was one that happened only a handful of times when the game really wanted to create a challenge. It had to be for the sake of challenge as there are some moments made for the purpose of tension and I got through those in a single run. Difficulty for the sake of challenge can work, only if there was some sense of knowing what you did differently in the attempt that worked. Here’s it falls more into throwing yourself into a wall and hoping it was paper instead of brick, doing the same thing over and over and some how getting different outcomes. The only other issue is one that does come with big caveats. The cost of the game at the moment is about £15 (on Steam where I played it). If you manage to single shot all the platforming and don’t stray for collectables you could be done in 3-4 hours. My total time ended around 6-7 hours with a fair few re-dos and some straying. So a 100% completion file could stretch the total time to around 10 hours. So there is three ways to look at the cost ratio. The first is the 3-4 hour single run for £15. That is not good costings and is not worth the money. If your going for the 6-7 hour run then it comes to a slightly more even price but that depends on the person. I wouldn’t complain if you said that it was pricey for the time spent. But for a 100% file run I would say the cost is about right. Saying that puts me in the awkward position where I think eking out every last drop out of the game is where the most value lies. And I can’t stand by that from the perspective of the ‘average player’. So I have to hose down that part of me and say, at the risk of seeming overly cruel, that it is a bit to pricey for the time most people would get out of it. But that doesn’t mean that the game isn’t coming recommanded. The game looks amazing. I didn’t use that Miyazaki-ien comparison lightly. 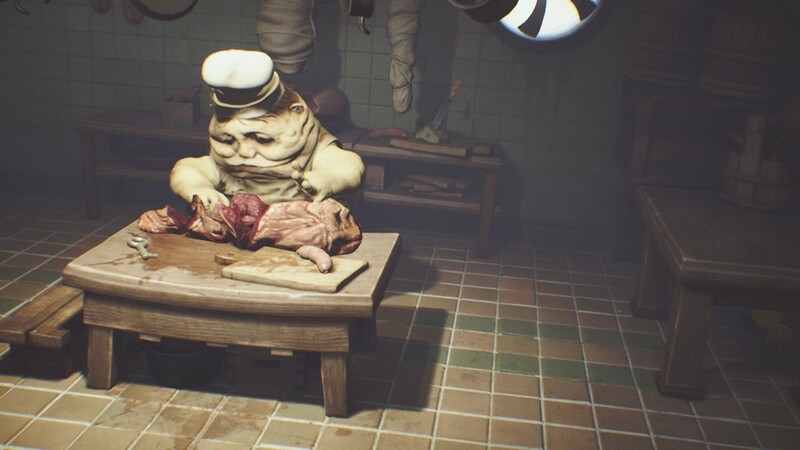 From a stylistic stand point, this is one of the best games regarding visual design this year. 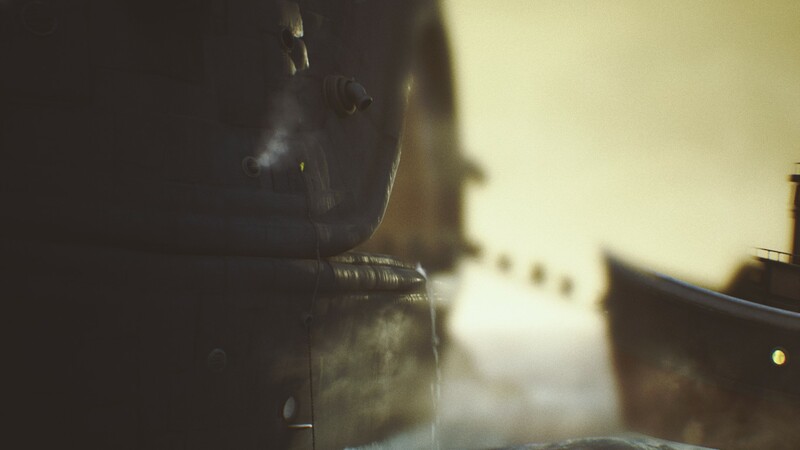 It’s symbolism and metaphors are shot well to the player, the grim and dank sections of the ship marred in shadow compared with the grotesque and horror sections lightly coloured and brightly lit heighten the sense of dread as you progress, and the story has so much emotion even with out any spoken lines that it ends with the player being slowly detached from Six as she becomes the ‘little nightmare’. This game stands as this years “Seasons After Fall” to me. 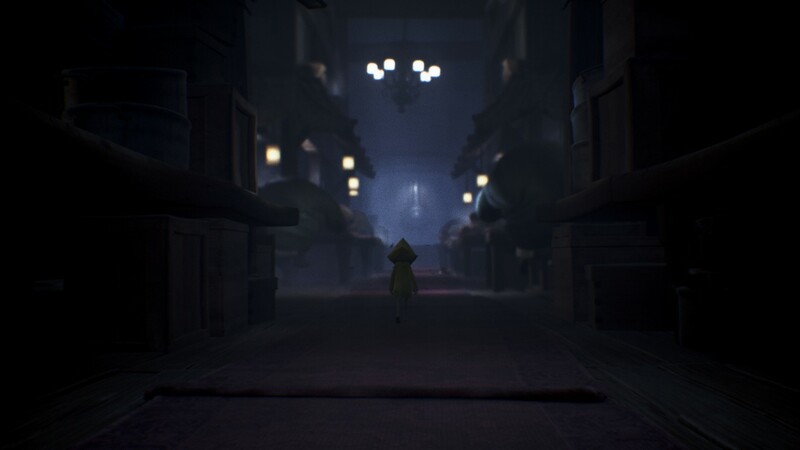 An artistic game that will most likely end up as one of the best games of the year. But that price to average playtime and precision platforming can’t be ignored. It ends up being a pretty obvious blemish on the face of the game but the rest is so good. This is a must play game. If that £15 seems to much for a 5-6 hour game, wait for a sale. Then as soon as it hits near £10, buy it immediately! You will not regret.